Witnessing the woods waking up, seeing sunlight filter through the trees, and hearing songbirds greet the new day - spring turkey season is a tranquil treat for the senses! But there's nothing that will kick start your heart faster than the gobble of the wild turkey. Florida’s spring turkey season opens Saturday, March 2 on private lands south of State Road 70 and Saturday, March 16 in the rest of the state. For hunters who live for spring mornings in the turkey woods and for those who yearn to try it, we offer the following tools and resources to help you make the most of this opportunity. 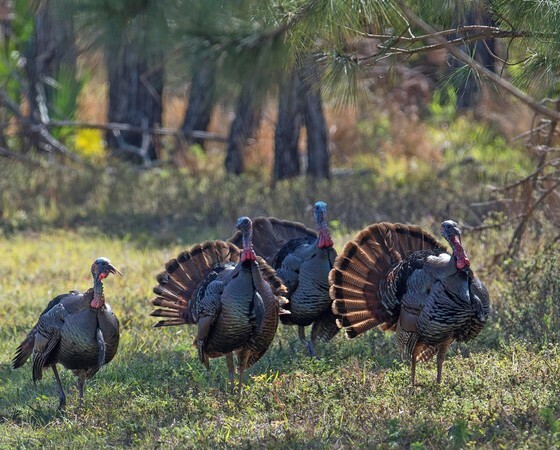 Discover the range of Florida's two wild turkey subspecies - the Osceola and the eastern. Check out FWC’s web-based interactive map, which predicts the general location of wild turkeys in the Sunshine State. Find a WMA to hunt wild turkeys without a quota permit. Locate season dates, bag limits and other regulations quickly and easily. Hit the easy button to get your hunting license and permits. Visit MyFWC.com/License to learn more or head to GoOutdoorsFlorida.com to buy your license today! Brush up on these turkey hunting safety tips or take a hunter safety course to learn more about safe, responsible hunting. Practice your calling. Check out this video for some turkey calling basics and hear the most common turkey sounds. 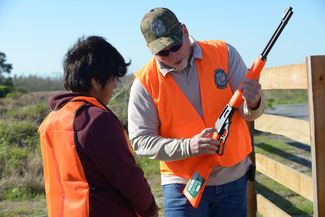 Create the next generation of hunter conservationists by introducing a young person to turkey hunting during the Youth Spring Turkey Hunt Weekends, held Feb. 23-24 south of State Road 70, and March 9-10 in the rest of the state. Celebrate a successful hunt with a healthy, delicious meal. Our partners, the Fresh From Florida chefs, developed several mouthwatering wild turkey recipes that are so good, you’ll want to share them with friends and family! Apply for an Outstanding Gobbler Certificate if you’ve harvested an especially nice gobbler. The FWC’s Wild Turkey Registry recognizes gobblers that meet certain minimum beard and spur length requirements. When is spring turkey season? On private land, turkey season south of State Road 70 runs March 2 – April 7. North of State Road 70 the season runs March 16 – April 21. For hunting season dates on public land, see the WMA regulations brochure for the area you’re interested in hunting. Where can I hunt on public land this spring? The FWC offers public hunting areas across the state where you can hunt turkeys without a quota permit. What license and permits are required to hunt turkeys on public land? To hunt a wildlife management area (WMA), you need a management area permit as well as a hunting license and turkey permit. Depending on the area, you may also need a quota permit. For area specific information, see the WMA regulations brochure for the area you’re interested in hunting. What is the bag limit for wild turkeys? Only gobblers and bearded turkeys may be taken. The spring season bag limit is 2. On private lands, you may take 2 turkeys in a day. The daily bag limit on WMAs is 1. For area specific information, see the WMA regulations brochure for the area you’re interested in hunting. Visit MyFWC.com for more regulations information. Youth from across the state will be competing for top archery honors during the 2019 National Archery in the Schools Program Florida State Tournament. Admission to the Feb. 23 event in Bartow is free for spectators. Those who attend will see boys and girls from a wide range of ages, skill levels and physical abilities master the skills and discipline needed to succeed at archery. 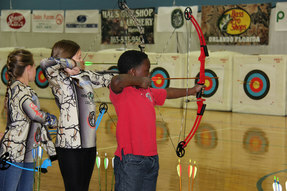 The National Archery in the Schools Program (NASP) teaches international style target archery in 4th-12th grade physical education classes as part of a cooperative effort between the FWC and the Florida Department of Education. Archery provides benefits such as helping to build muscle endurance, flexibility, hand-eye coordination, and grip and body strength. 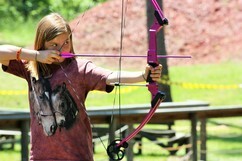 To learn how your school can be involved in NASP, visit MyFWC.com/NASP. Hunter safety courses are a great way to learn more about responsible hunting, firearms safety, and wildlife conservation. Students can attend a no-cost traditional classroom course or complete the classroom portion online. FWC’s website offers several online courses including a FREE option. After the online classroom portion is complete, you’ll need to sign up and attend a skills day. 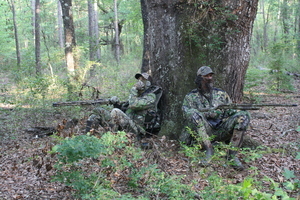 Learn more about Florida’s hunter safety course options. The Youth Hunter Education Challenge (YHEC) teaches youth aged 18 and younger about leadership, safety and conservation while building skills and knowledge related to hunting, map and compass, wildlife identification and target shooting. Find and register for a YHEC event today. The Youth Hunting Program provides opportunities for hunter safety graduates between 12 and 17 years old to experience hunting. Check out the calendar for safe, educational, mentored youth hunts for wild hogs, squirrel and wild turkeys. FWC Summer Camps – outdoor adventure that’s safe, affordable and fun! The FWC's summer camps offer specially designed programs where youth can receive their hunter safety certification, expand on archery and bowhunting basics, practice their target shooting skills and learn about everything from wildlife conservation to outdoor skills such as fishing and paddling. Our summer camps are available for kids who have completed 3rd grade and up. Spots are limited, so register your kids today for the experience of a lifetime! When: Saturday, March 9 @ 5 p.m. When: Wednesday, March 13 @ 5:30 p.m.